Fiction – paperback; Picador; 382 pages; 2001. The Fall of Light is Niall Williams‘ third novel — he has seven to his name. Of the ones I’ve read, I’ve come to appreciate his elegiac prose style and much enjoy his themes of love and loss, all set in Ireland. The story is set in 19th century Ireland. The blurb on my edition is misleading, because it claims the story begins during the famine. It doesn’t. The famine occurs a good way into the story and even then you’d be hard pressed to say this is a book about the Irish famine. The horror of it is there, but only in the background, and even though several characters sail to America on what must have been “famine ships”, it is not starvation that drives them to leave their homeland. It is love. Or a sense of adventure. Or as a way of escaping heartache. There’s a lot of that in this novel — love, adventure and heartache — and if I was to come up with a one-line description I’d say it’s a kind of road story about a family, scattered across the world, which struggles to be reunited once again. All kinds of disasters and tragedies befall the Foleys — Francis and his wife Emer, and their four sons, Tomas, Finbar, Finan and Tiege — which makes this struggle all the more difficult. But there are also moments of unimagined good luck, quiet successes and amazing co-incidences, which injects the story with a sense of optimism. When The Fall of Light opens Emer has fled the family home after a row with Francis. Francis responds impulsively by setting out to find the rugged West coast, his four children in tow. He burns the house down before leaving. But then tragedy strikes when one of the party is swept downstream while crossing a swollen river. This sets the pattern for the remaining 300 or so pages, because an awful lot of things — good and bad — happen to these characters, and you’re never sure what’s going to befall them next. But strangely the story lacks tension and momentum, perhaps because it is told from too many divergent points of view and reads as a series of anecdotes rather than one streamlined narrative. Even when there are hints of drama — such as Tiege stealing into the room of his upper-class beloved to watch her sleeping without her knowing — it fizzles out almost as soon as it begins. The story leaves him and returns to the island. Always the story returns there. The teller changes the lens and the green slope of the island appears in focus. And it is as if the teller understands that the island is an image for all Foleys thereafter, after there was something passionate and impetuous in the character of the family that made each of its men islands in turn, and that this was a trait deeply fated and irreversible. 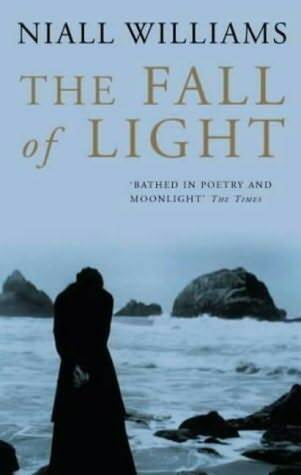 That said, The Fall of Light is filled with gorgeous language and lovely turns of phrase, the type of writing that is best appreciated slowly. But the lack of narrative drive makes the story gentle and meandering, which is wonderful if you like that sort of thing, and tedious if you don’t. I would like to read it just for the language and turns of phrase alone. Hi Mystica, glad to know my review hasn’t put you off. Was slightly concerned I may have been too harsh with this one. But the language is, indeed, a real delight. Finally you have found an Irish author that I don’t have to add to my already very high Irish pile. Whew. Don’t be too hasty, Kevin. His debut novel, Four Letters of Love, is astonishingly good — and definitely one of my all-time favourites. I read it long before I started this blog, hence no review online. I’m still intrigued to read his other stuff — and have added his later novels to my wishlist. It’s disappointing when an author you really like doesn’t quite hit the mark you’ve come to expect. I think using an omnipresent narrator can work well, but sometimes that detached view can subtract from the overall arch of the narrative. As a reader, I’m always aware of such a narrator relating the story, and wondering if he or she is actually reliable, and what is not being said. If you’re interested please visit me! Oh yes, do read Four Letters of Love, Danielle. It’s such a beautiful book. I have very fond memories of it. It’s a pity this book didn’t work for me, but that’s not to say it wouldn’t work for someone else. Perhaps I just wasn’t in the right “headspace” to read this one when I did. The good thing is that the omnipresent narrator really only butted in at the start of each new “part” — there are four parts in total. But you’re right: the detached view can spoil the overall arch of the story, and you do wonder whether they’re reliable or not. Hi Vickie, thanks for your comment. I have no idea what an ARC tour is, but if other UK bloggers want to take part they’re free to click your link. It is always most annoying when you have an author you love, one of their books which has recieved high acclaim which your looking forward to and then… well, it just doesnt quite work for you. I get a bit narked internally when this happens, thank fully though its not too often. I have seen this author in the library a few times and given him a ponder. Maybe I should try his debut novel at some point? Oh yes, Simon, do try his debut. It’s very very good.